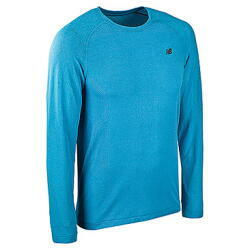 Base layers play a large role in your comfort during the fall and winter. The base layer shirt is the piece that should fit close to the body and will wick the moisture from your skin and prevent chafing and rubbing. We want you to stay dry and warm as it gets cold, so stay away from cotton! . If you prefer to put another layer over the base layer, be sure to add another moisture-wicking piece that will keep you comfortable throughout the run.